The Little Birdie model is an 11″ wood tone ring old time, open back, banjo with a 25 1/2″ scale. 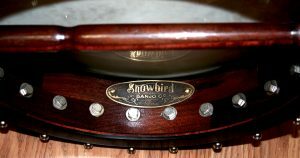 The name “Little Birdie” harkens to the Snowbird name and the trademark snowy “Owl” that Jeremy designed to have a feel of a Gryphon on the old Vega banjos. Little Birdie is also the name of a song with the words “Little birdie, little birdie, come and sing to me your song” and we just think that is a perfect portrayal of our banjos. 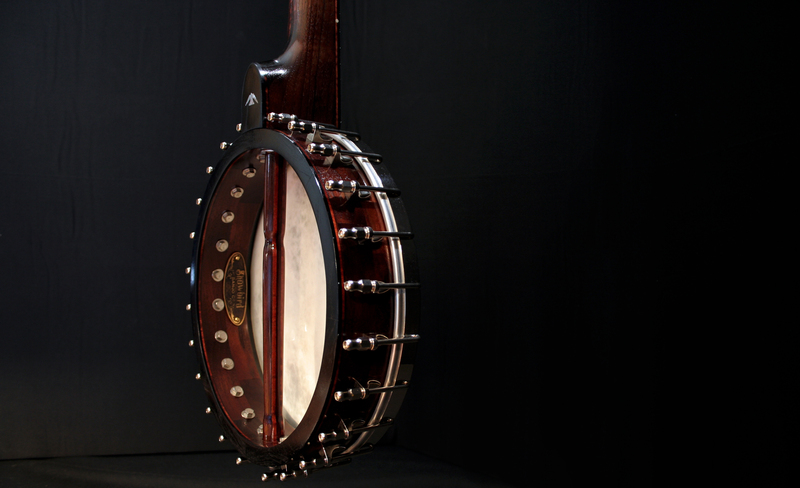 Our goal in giving the model name is to have one banjo configuration that is easily and quickly reproducible and can be economically priced so we can get these banjos to folks seeking a banjo who are just starting out or who just like the sound of the “woody” banjo. Neck: Five piece laminated pinstriped walnut neck, abalone fret dots, and no inlay on the headstock. Ebony Fretboard and headstock faceplate. Nickel 5 Star planetary tuners with ebony keys. Rim: Block style walnut rim (although steam bent rims are being planned later), with pinstriping and ebony rim cap as well as an ebony tone ring. The rim head will consist of a Elite fiber skin head with nickel plated tension hoop, shoes, and hooks. A brass acid etched and aged company label with serial number is affixed inside the rim. Finish: Aniline Dye stain with a Tru-Oil finish. Inlay can be added if requested for additional fee or added after purchase. Here is Snowdrop played with no sock or muffle. To view the currently available banjos, please check out the New Banjos menu item. Beautiful banjos! Great work! Makes me want one!